"Vianney", a one-man play based on the life the patron saint of priests, St. John Vianney, is coming to St. Maximilian Kolbe Parish Nov. 5. St. Maximilian Kolbe Parish in West Chester will host a one-man drama, “Vianney,” on Thursday evening, Nov. 9 on the life and mission of St. John Vianney. It is presented by Saint Luke Productions which is based in Washington State and it will feature actor Leonardo Defilippis, who is president and founder of the company. Over the past 37 years St. Luke Productions has focused on the lives of a number of saints with presentations around the country. In 2014, St. Maximilian Kolbe Parish was host to a presentation of their patron saint, Father Maximilian Kolbe, also featuring Defilippis. That drew an audience of 400. St. John Vianney (1786-1859), who is often called the Curé of Ars, was born in France in a farming village on the eve of the French Revolution. His family persevered in the faith during that very trying period, and when the church was restored by Napoleon, John opted for the priesthood. Although he had difficulties with his studies, particularly Latin, he persisted and was ordained in 1815. In 1818 he was named Curé (parish priest) for Ars, a tiny village in Southwestern France. He remained there until his death. He was especially famed for his effectiveness in the confessional. In 1925 he was canonized and in 2009, which was declared the Year of the Priest, he was designated the patron saint for all parish priests. “John Vianney was someone who was able to convince people that the process of reconciliation was something to be desired,” said Msgr. Robert Carroll, the pastor of St. Maximilian Kolbe Parish. “He really changed the culture of Ars in his time. “We need to help people live with an awareness of God’s grace. It’s not just people going to confession, it is a call to be merciful people themselves” after receiving the sacrament, Msgr. Carroll said. Reached by telephone at his West Coast office, Defilippis said Saint Luke Productions originally took its name from their first presentation — the Gospel of St. Luke. A few of the other saints whose lives have been dramatized are St. Francis of Assisi, St. John of the Cross, St. Faustina, St. Augustine and St. Therese of Lisieux, a personal favorite of Defilippis. “Vianney” was added to the repertoire in 2009 because it was the Year of the Priest, and has been a favorite ever since. St. John Vianney entered the seminary with very little formal education but that was a desperate time. So many priests had been killed in the aftermath of the French Revolution that there was a real need for priests. Because of his struggles in the seminary, the local church authorities, doubting his intelligence, would not allow him to hear confessions until about a month after he was ordained. “They were afraid he would mess it up,” Defilippis said. “But he did more confessions than any priest in the history of the church. That is the irony. “For the last 20 years of his life he would start confessions at midnight and go almost around the clock. He was a slave to the confessional,” Defilippis explained, “but he would rather be a hermit. Actor Leonardo Defilippis portrays St. John Vianney in the one-man play “Vianney” coming to St. Maximilian Kolbe Church, West Chester, Nov. 5. “God, with his sense of humor, makes him the patron saint of priests. He takes the lowest and exalts them to the highest,” Defilippis said. 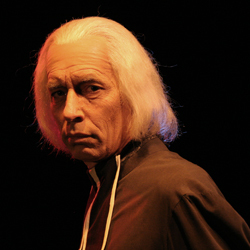 Another facet of St. John Vianney’s life that is dramatized in “Vianney” is his violent torments by the devil, who seemed to take personal affront to this humble priest and his work in bringing sinners back to God. For this reason the performance is not recommended for children under 9. Each of the saints portrayed by Defilippis or one of the other actors at Saint Luke Productions is unique. “Every saint is a window into Christ. St. John Vianney was definitely a shepherd and a pastor from the get-go,” he said. For tickets for “Vianney” on Nov. 9, call St. Maximillian Kolbe rectory at 610-399-6936, email the parish at saintmax@comcast.net or visit the parish website at St.Max.org.